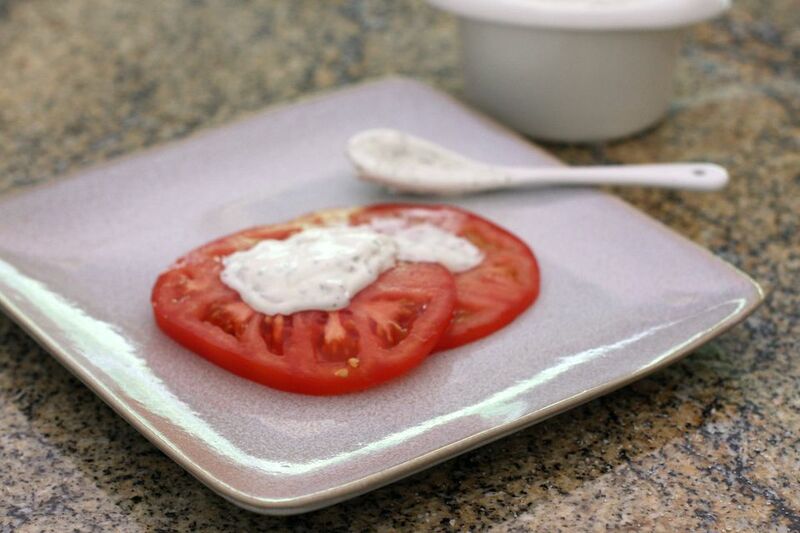 This delicious sour cream and dill dressing is the perfect topping for fresh sliced tomatoes, making a quick and easy side dish for any cookout or summer meal. Serve it with fresh sliced cucumbers, with salmon fillets or croquettes, or along with a composed or chopped salad. The dressing is a snap to put together. Just mix and refrigerate the sour cream dressing until you're ready to serve. Slice the tomatoes and arrange them on a plate with a small bowl of the sour cream dressing on the side for family or friends to serve themselves. In a bowl, combine the mayonnaise, sour cream, dried dill, salt, pepper, and onion. Stir to blend. Cover and refrigerate the sour cream dressing until serving time. Serve the sour cream and dill dressing with the sliced tomatoes or serve it along with fish, cucumbers, or a tossed salad. It's especially nice with salmon or with a salad with grilled salmon. Add 1 tablespoon of lemon juice to the dressing mixture. Add about 1/2 teaspoon of garlic powder to the dressing mixture.